Seriously Fresh & Seriously Yummy! Blair and I have been trying to gradually switch our eating style over to Paleo – a.k.a. primal, caveman diet, no grain. So far it’s been an amazing lifestyle change and one that we both have been excited to dive deeper into the more we are on it! My only complaint right off bat was no sugar. Instantly I thought that meant no more cakes, ice cream, brownies, cookies and so on. The little fatty in me was devastated! However, the more I read and studied what Paleo is really about, I’ve found that I can still enjoy the natural sweets God has given to us! 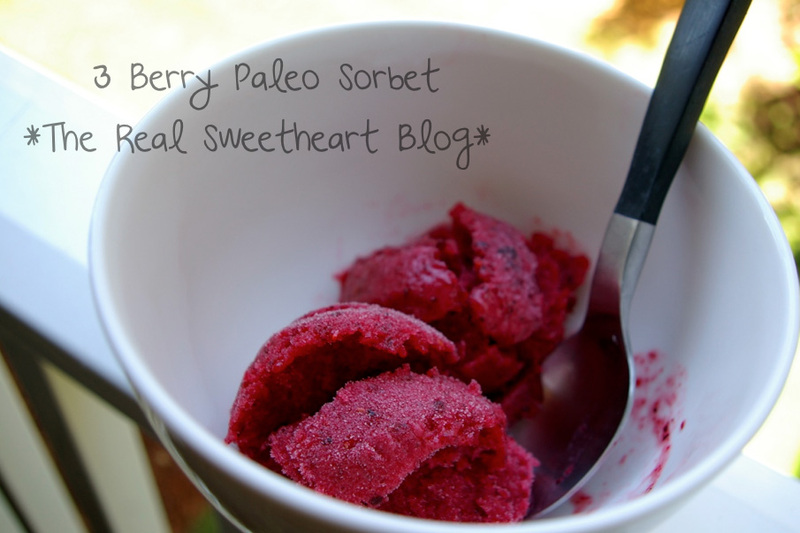 That’s when I got to experimenting and made my first homemade all natural sorbet! A super yummy treat that cures my sweet tooth, while still being healthy! The steps are below! In a small saucepan, combine 1 cup of water and 1 cup of honey to create a natural simple syrup. Mix together on low/medium heat until both are combined, then place in a separate container to cool. *Don’t let it boil! Using either a food processor or blender, mix together the berries and 1/3 cup of water until well blended. Filter out the seeds by placing a sieve into a bowl and pouring the mixture on top of it. *This may require some work to make sure you get all of the juice! I just used a coffee filter to do this job. Add 1 cup of your simple syrup mixture to the berry juice (there should be about 2 cups of that after filtering it). *Play with the amount of simple syrup you add. 1 cup may be too much or too little for your taste! Let the mixture chill for an hour or so. Put into your ice cream maker and get to freezing! *Make sure to follow the instructions for your particular ice cream maker. Mine took 30 minutes to properly chill and set up. Place in an airtight container and keep it in the freezer! 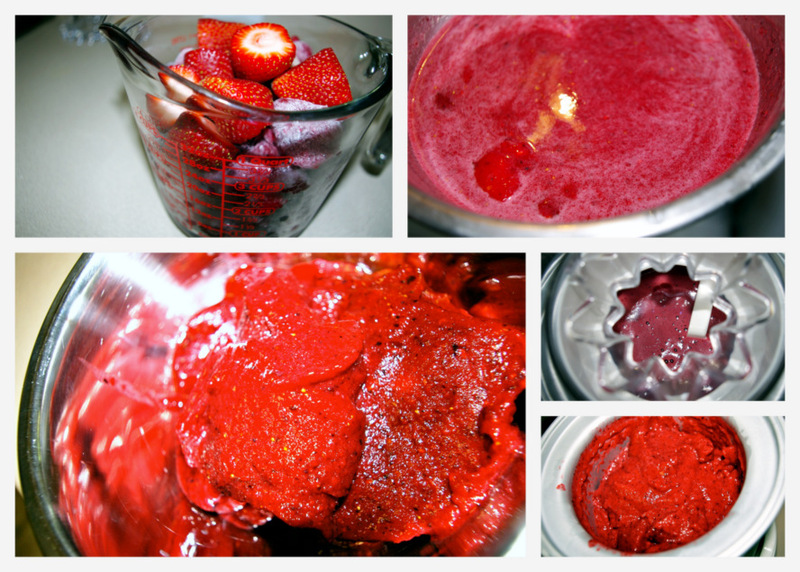 I’m excited to play with even more versions of this – today I saw a strawberry lime sorbet on Pinterest! Sounds heavenly to me! I purposely made this photo smaller… Not only does the dirty spot gross me out, but it’s also just straight up embarrassing! It was nasty. Something spilled and it was a terrible sticky mess to clean up. At first, I scrubbed with a sponge to get the residue picked up, but after having no success at doing so I pulled out my handy dandy Steamer. Honestly, I wouldn’t be posting this for people to see unless I really truly believed in Steam Cleaning. It works wonders while sanitizing and I’m not too sure why it didn’t click until now to use it on and in my fridge. After all, I use it on everything else in the kitchen, bathroom and practically the whole rest of the apartment… I even use a Shark Steam Mop on our floors! Anywho, the first thing you’ll need is a reliable steamer. I use a Scunci Steamer and I love it, but there are plenty of others on the market for less. Just make sure to read the ratings before you invest in one! Glad Press’n Seal *Optional – used to line any flat solid shelves for quick and easy clean-ups in the future! Get your steamer filled with water and warming up. While the steamer is warming up, clear your fridge and get rid of any bad food. Remove any shelves and drawers that you are able to. *You essentially want a blank slate so you can get into every nook and cranny. Get to steaming! Steam any spills or touch residue first and wipe up with your old rag then get into the tight spots! Once most of the loose residue is steamed and picked up, spray your cleaning solution all around and let it sit for a minute. Wipe up with your clean rags. Since I had a solid shelf, I lined the top of it with Glad Press’n Seal to help quickly clean up spills in the future. Nice clean fridge! P.S. Glad Press’n Seal is shown in the bottom right photo! Now that I’ve cleaned my fridge this way I can’t imagine doing it any other way. This is a must do for anyone! It makes cleaning the fridge no longer a hassle, but rather quite therapeutic – now, I don’t know about everyone else, but that’s my type of cleaning! They are delicious, brown-sugary, chocolate-chippy, chewy-gooey cookie brownies. So, in other words, mouthwatering. While I wouldn’t necessarily recommend brookies for a wedding (they can get a little messy), they are perfect for a bridal shower or even as a cute thank you gift for close friends and family after the wedding has happened! I made these brookies for my boyfriend’s dad’s “23rd” birthday. 😉 And considering they were gone before I knew it, I’m taking they were a huge hit for their family and would be for yours too! Now with all of the ingredients on hand, let’s get to baking! Isn’t that a beautiful color? Cannot wait to eat this! I added the dry ingredients in bits so they didn’t fly everywhere when I turned the mixer back on. DON’T forget to scrape the sides! Nobody wants left over flour clumps when they’re trying to enjoy their brookie. The dough should be a beautiful golden color with plenty of chocolate chips! My friend Julia and I had such a hard time resisting the brookie dough……. but we survived the temptation! Delicious and beautiful. It’s the perfect combination! Blog Queen Bakerella shared this recipe last May. While she suggested mixing the batch up by hand to make the texture “better”, I went ahead and just whipped up the quick recipe in the mixer. I found the final product to be perfect for my taste, but included the “By Hand” instructions for you to try out in case you wanted to experiment with different mixing avenues! Best of luck in your baking! Stir brown sugar into softened (not melted) butter in another large bowl until butter disappears. You can use the back of your spoon to help incorporate the two together. -Coat a 13 X 9 pan with non-stick spray and spread batter evenly into dish. Bake at 350 degrees for 30 minutes or until top is golden brown. Make sure you don’t over bake. **My oven cooked the brookies perfectly in 30 minutes, but make sure you know your oven… If your oven runs on the cooler side and the top of your brookies are already golden brown, but the inside isn’t cooked yet, just throw on a sheet of aluminum foil and bake until a toothpick comes out clean! I like my cookies on the doughier side so I made my brookies that way too! It is all up to you though on that aspect!